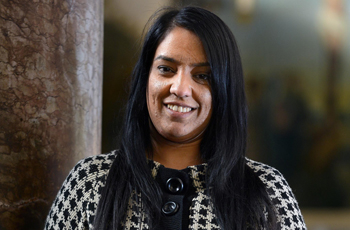 Naz Shah has served as Labour MP for Bradford West since 2015. Recently in the June 2017 General Election, Naz received 29,444 votes, which equaled a 64.7% majority, retaining her seat. Born in Bradford West, Shah is a mother of three and a newly elected MP. Prior to being elected, she was the chair of the mental health charity, Sharing Voices Bradford. After the general election in 2015, Shah became a member of the Women and Equalities Select Committee. Frustrated by the lack of commitment of Bradford's previous MP, George Galloway, Shah became politically involved at the local level and decided to run to become MP - a campaign in which she fought for the people of Bradford rather than against her opponent. She identifies with the Labour values of fairness, equality, and justice, and in five years hopes to have brought greater employment, cleaner streets, and a stronger sense of community to Bradford.